Find out the new AFW ERGON! 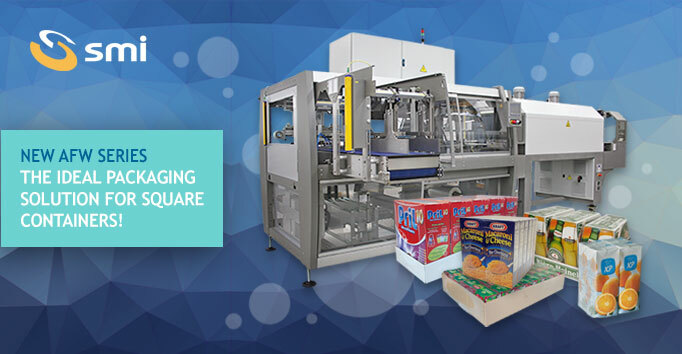 The AFW series is equipped with a 90°-entry product infeed conveyour which ensures a continuous and fluid packaging of odd-shaped containers, such as briks, or products that may be unstable during their motion on a conveyour belt. This solution ensures an uninterrupted flow of the loose containers coming from the production line on a conveyour belts equipped with low-friction chains. In the shrinkwrapper's infeed section , loose containers are clustered in the required collation by a pneumatic device coupled with an electronic dividing axis (push-in system), before entering the film wrapping section and the shrinking tunnel. For further information about AFW ERGON series, do not hesitate to contact SMI Sales Department.